The Chair of Political Governance and Public Policy at the Public Administration Academy of RA invited Mher Sahakyan, PhD in International relations, head of the “China-Eurasia” council for Political and Strategic Research, to deliver lecture on April 9. He introduced and analyzed China’s policy on Iranian nuclear issue within and beyond the UN Security Council. He also spoke about Sino-Iranian cooperation after the signature of the Joint Comprehensive Plan of Action in the context of the Belt and Road Initiative. As he mentioned in the 21st century nuclear issues are still the main threats of international security. Iran appeared in very difficult economic situation, because of its nuclear program, which IAEA could not identify as fully peaceful. As a result, the UNSC imposed sanctions on Iranian economic, financial, military spheres, which caused economic difficulties. For this reason, Iran had to make some concessions for easing sanctions. 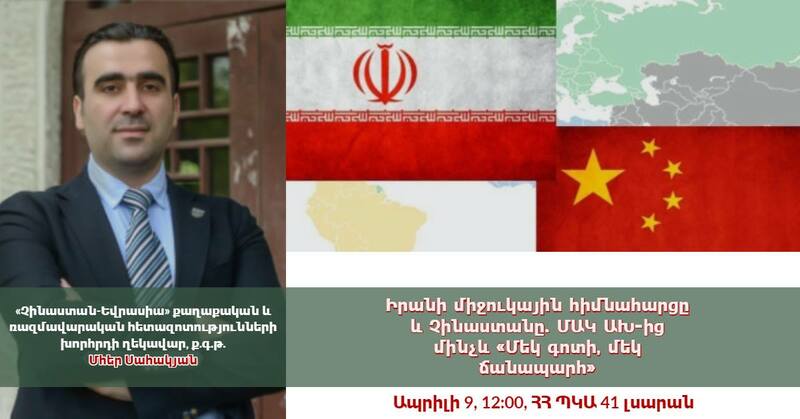 Mher Sahakyan introduced differences and similarities between the presidencies of Khatami, Ahmadinejad and Rouhani regarding China’s role in the Iranian nuclear issue. The speaker noted that on one hand, China has always been against that Iran creates nuclear weapons, but in the other hand it has been against military resolution of the conflict. It has never used unilateral sanctions against Iran, yet it voted for the sanctions, which were imposed by the UNSC. “China always tried to derive benefit from the conflict between Iran and the USA” said Mher Sahakyan stating that in the future the relationship between Iran and China will be more complicated and limited in the framework of Belt and Road initiative, because of the US unilateral sanctions, which were imposed by Washington. And the decisive moment of these relations will come when the sanctions expand on the energy-carriers exported to China. As he mentioned, “China is interested in solving the Iranian nuclear issue in a peaceful way and by preserving the stability of Iran for five main reasons: China is interested in Iran’s energy sources, China is interested in Iran’s stability because it is located in the center of important energy communications and transportation routes, China is interested in a strong and safe Iran as it reduces US influence in the Middle East, Iran is an important market for Chinese products and China sees Iran as an important player in the Middle East for its Belt and Road Initiative. The framework of questions was not limited within the China-Iran relations. There were questions about China-USA and China-Armenia relations, as well as about Russia’s growing role in international relations. Mher Sahakyan donated 2 copies of his monograph “China’s ‘Belt and Road’ Initiative and Armenia to the library of PAARA. Mher Sahakyan is a member of British Association for Chinese Studies. He has defended his PhD at the Institution of International relations, Nanjing University, China.